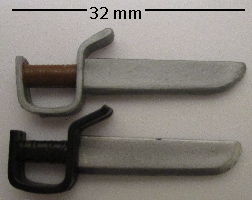 This page contains the most straightforward of bladed weapons: knives, swords, machetes, etc., sorted by approximate length. For other kinds of sharp weapons, see this page. in black and silver with Storm Shadow, the 25th-style Joe version on the 2007 Wave 1 single card, as well as his reissue on the 2007 Wave 4 single card. in black and silver with Storm Shadow, the short-sleeves 25th-style version in the 2007 25th Anniversary Cobra five-pack. in black and silver with Storm Shadow, the Valor-era 25th-style version in the 2007 Cobra Legions five-pack. in black and silver with Cobra Red Ninja, the black-belt version on the 2007 Wave 3 single card. in black and silver with Cobra Ninja Viper, the 25th-style version on the 2008 Wave 12 single card. 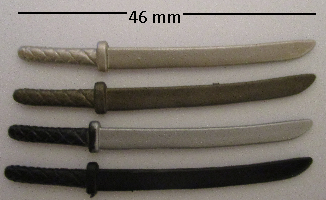 in black and silver with Storm Shadow, the grey-belt sleeveless 25th-style version in the 2009 Cobra five-pack. in black and silver with Storm Shadow, the black-belt sleeveless 25th-style version on the 2009 Hall of Heroes single card. in blue and silver with Storm Shadow, the comic 25th-style version in the 2008 Marvel #21 two-pack with Snake Eyes. in teal and silver with Storm Shadow, the caped 25th-style version in the 2008 Comic #21b two-pack with Snake Eyes. in brown and silver with Cobra Red Ninja Leader, in the 2008 Snake Eyes vs. Red Ninjas five-pack. in brown and silver with Cobra Red Ninja, the red-belt version in the 2008 Snake Eyes vs. Red Ninjas five-pack. in black and brown with Storm Shadow, the black 25th-style version on the 2008 Wave 9 single card. in white and tan with Spirit Iron-Knife, the 25th-style version on the 2008 Wave 7 single card. in black and silver with Red Star, the 25th-style version in the 2008 Comic #6 two-pack with Duke. in black and silver with Zartan, the Devil's Due 25th-style version on the 2007 Wave 3 single card. in black and silver with A.V.A.C., the 25th-style version with the Firebat Jet released in 2008.
in black and silver with Zartan, the red-pants 25th-style version on the 2008 Wave 11 single card. in black and silver with Zartan, the glowing-vest 25th-style version in the 2009 Cobra five-pack. in black and silver with Duke, the tan Resolute version on the 2009 Wave 13 single card. in black and silver with Alley Viper II, the blue version in the 2004 Wave 1 two-pack with Cobra Viper. in black and silver with Duke, the olive version in the 2008 Comic #6 two-pack with Red Star. in black with Lift-Ticket, the 25th-style version with the Ghost H.A.W.K. released in 2009.
in brown and silver with Swamp Rat, the tan version in the 2004 Wave 2 two-pack with Alpine. in black and silver (two copies) with Range Viper, the removable helmet version on the 2005 Direct-to-Consumer Wave 2 single card. in black and silver with Cobra Para-Viper, on the 2008 Wave 10 single card. in black and silver (two copies) with Cobra Eel, the 25th-style version on the 2008 Wave 11 single card. in black and silver with Cobra Diver, on the 2008 Wave 12 single card. in black with silver edge with Lieutenant Torpedo, the black 25th-style version on the 2008 Wave 6 single card. in black with silver edge with Deep Six, the green 25th-style version in the 2008 Senior Ranking Officers three-pack. in black with silver edge with Lieutenant Torpedo, the yellow 25th-style version in the 2008 Senior Ranking Officers three-pack. in grey with Ghost Bear, with the Cobra Pulverizer released in 2004.
in black with Heavy Duty, the grey Valor vs. Venom version in the 2004 Wave 1 two-pack with Razorclaw. in silver with Duke, the O-ring Valor vs. Venom version in the 2004 Wave 4 two-pack with Venomous Maximus. in silver (one pair) with Snake Eyes, the crossed-swords 25th-style version on the 2008 Wave 7 single card. 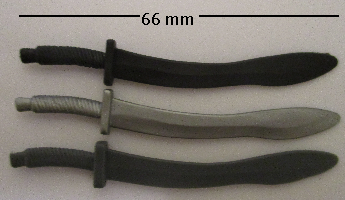 in black and silver (one pair) with Snake Eyes, the grey crossed-swords version in the 2009 Greatest Battles DVD pack. in olive and silver with Python Copperhead, with the Sting Raider released in 2009.
in light grey with Steam-Roller, with the Mobile Command Center released in 1987.
in light grey with Interrogator, the purple version offered by mail in 1993.
in black and silver with Snake Eyes, the 25th-style visor version on the 2007 Wave 1 single card. in black and silver with Snake Eyes, the grey 25th-style version in the 2007 25th Anniversary G.I. Joe five-pack. in black and silver with Sergeant Stalker, the medium green 25th-style version on the 2007 Wave 3 single card as well as his rare yellow variant. in black and silver with Snake Eyes, the dark blue 25th-style version in the 2008 Marvel #21 two-pack with Storm Shadow. in black and silver with G.I. Joe Hawk, the olive 25th-style version in the 2008 Marvel #1 two-pack with Scarlett. in black and silver with Snake Eyes, the torn 25th-style version in the 2008 Comic #21b two-pack with Storm Shadow. in black and silver with G.I. Joe Hawk, the staff uniform 25th-style version in the 2008 Senior Ranking Officers three-pack. in black and silver with Grunt, the 25th-style version in the 2008 Senior Ranking Officers three-pack. in black and silver with Snake Eyes, the green-pants 25th-style version in the 2008 Snake Eyes vs. Red Ninjas five-pack. in black and silver (with flatter grip) with Roadblock, the light 25th-style version in the 2008 The Revenge of Cobra DVD pack. in black and silver with G.I. Joe Trooper, one each with all four versions in the 2008 Firefly vs. G.I. Joe Troopers five pack. in black and silver with Dataframe, the 25th-style version in the 2008 Comic #11 two-pack with Beachhead. 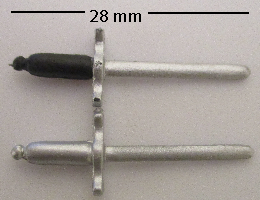 in black and silver with Short-Fuze, the 25th-style version in the 2008 Ultimate Battle Pack. in black and silver with Steeler, the tan 25th-style version in the 2008 Ultimate Battle Pack. in black and silver with Sergeant Stalker, the dark green 25th-style version in the 2008 Ultimate Battle Pack. in black and silver with Snake Eyes, the dark-bandolier visor version on the 2009 Hall of Heroes single card. in black with silver on the edge of the blade, with Snake Eyes, the flat-black 25th-style version on the 2008 Wave 5 single card. in black with silver on the edge of the blade with Snake Eyes, the glossy-black 25th-style version on the 2009 Hall of Heroes single card. in green with Rock 'n Roll, the dark 25th-style version on the 2008 Wave 6 single card. in black Double Clutch, the 25th-style version with the VAMP released in 2008.
in grey (with flatter grip) with Rock 'n Roll, the light 25th-style version in the 2008 Marvel #25 comic two-pack with Deep Six. in silver with Serpentor, the original version with the Air Chariot released in 1986, as well as his reissues by mail in later years. Some by mail included more than one copy of the knife. in silver with Serpentor, the black version in the 2002 Real American Hero Collection two-pack with Shock Viper. in black with Serpentor, the comic version in the 2005 Marvel #49 three-pack. in black with Dart, the green-vest version in the 2002 Wave 4 two-pack with Cobra C.L.A.W.S., as well as his reissue in the 2004 Battle in a Box set. in black with Dart, the yellow-vest version with the Gun Station released in 2004.
in black (two copies) with Interrogator, in the 2006 Viper Lockdown six-pack. in silver with Flint, the black shirt version in the 2002 Wave 3 two-pack with Baroness. in silver with Gung Ho, the Action Attack version in the 2004 Wave 4 two-pack with Wild Weasel. in grey with Gung Ho, the Spy Troops version in the 2003 Wave 8 two-pack with Zarana (both brown and blond hair variants). in grey with Tunnel Rat, the yellow Valor vs. Venom version in the 2005 Wave 6 two-pack with Razorclaw. in dark grey with Beachhead, the Tiger Force version in the 2004 Dreadnok Rampage convention set. in dark grey with Dreadnok Thrasher, the red version in the 2004 Dreadnok Drivers convention two-pack with Dreadnok Zanzibar. in dark grey with Sergeant Slaughter, the tan version released at the 2006 G.I. Joe convention. in dark grey with Rock 'n Roll, in the 2007 Tanks for the Memories convention set. in dark grey with Shockblast, the green version in the 2008 S.W.A.T. convention three-pack. in black with Range-Viper, the original version on the 1990 single card. in black with Rock Viper, the Range-Viper recolor in the 2000 Real American Hero Collection two-pack with Maj. Bludd. in black with Snake Eyes, the blue-trim Joe vs. Cobra version in the 2002 Wave 1 two-pack with Storm Shadow. in black with Storm Shadow, the white-and-red Joe vs. Cobra version in the 2002 Wave 1 two-pack with Snake Eyes. in black with Snake Eyes, the green-trim Joe vs. Cobra version in the 2002 Wave 1.35 two-pack with Storm Shadow. in black with Storm Shadow, the grey-and-red Joe vs. Cobra version in the 2002 Wave 1.35 two-pack with Snake Eyes. 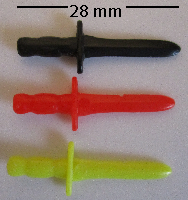 in black with Cobra Slice, the red-and-grey version in the 2002 Wave 1.5 two-pack with Sure Fire. in black with Tomax, in the 2002 Crimson Strike Team convention set (both crimson and fuchsia variants). in black with Xamot, in the 2002 Crimson Strike Team convention set (both crimson and fuchsia variants). in black with Storm Shadow, the black-and-white Joe vs. Cobra version in the 2002 Wave 3 two-pack with Agent Scarlett. in black with Ninja Trooper, in the 2004 Wave 5 two-pack with Night Creeper. 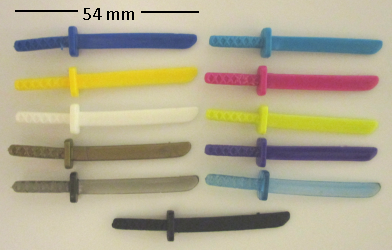 in white gold (two copies) with Storm Shadow, the Action Attack version in the 2004 Wave 1 two-pack with Snake Eyes. in black and silver (two copies) with Storm Shadow, the unmasked version offered by mail in 2005.
in black with Guile, the green version on the 1993 Capcom Street Fighter II single card. in neon yellow with Law, on the 1993 Battle Corps card. in red with Long Arm, the original version on the 1993 Battle Corps card. in black and silver with Cobra Officer, the grey mask 25th-style version on the 2007 Wave 1 single card. in black and silver with Cobra, the red-symbol version in the 2007 25th Anniversary Cobra five-pack. in black and silver with Baroness, the wavy-hair version in the 2007 25th Anniversary Cobra five-pack. in black and silver with Cobra, the white-symbol version on the 2007 Wave 2 single card. 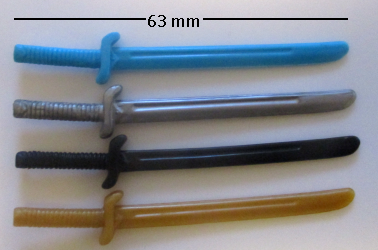 in black and silver with Cobra Trooper, the red mask/yellow straps version in the 2007 Cobra Legions five-pack. in black and silver with Vehicle Driver, in the 2007 Cobra Legions five-pack. in black and silver with Cobra Air Trooper, in the 2007 Cobra Legions five-pack, as well as his reissue on 2007 Wave 4 single card. in black and silver with Scarred Cobra Officer, in the 2008 Comic #32 1/2 two-pack with Crimson Guard. in black and silver with Cobra Officer, the black mask 25th-style version in the 2008 Senior Ranking Officers three-pack. in black and silver with Cobra Trooper, the grey straps version in the 2008 Senior Ranking Officers three-pack. in black and silver with Cobra Night Watch Trooper, the red-brown-hair version in the 2008 Cobra Night Watch five-pack. in black and silver with Cobra Night Watch Trooper, the dark-brown-hair version in the 2008 Cobra Night Watch five-pack. in black and silver with Cobra Night Watch Trooper, the yellow-brown-hair version in the 2008 Cobra Night Watch five-pack. in black and silver with Cobra Night Watch Trooper, the medium-brown-hair version in the 2008 Cobra Night Watch five-pack. in black and silver with Cobra Night Watch Officer, in the 2008 Cobra Night Watch five-pack. in black and silver with Crankcase, the 25th-style version with the green A.W.E. Striker released in 2008.
in black and silver with Cobra Trooper, the white straps version in the 2008 The M.A.S.S. Device DVD pack. in black and silver with Cobra Bazooka Trooper, on the 2008 Wave 10 single card. in black and silver with Flint, the Cobra disguise version on the 2008 Wave 11 single card. in black and silver with Cobra Vehicle Gunner, in the 2008 Ultimate Battle Pack. in black and silver with Cobra Trooper, the red mask/black straps version on the 2008 Wave 12 single card. in black and silver with Cobra Officer, the tan version in the 2008 Desert Assault Squad seven-pack. in black and silver with Cobra Paratrooper, in the 2008 G.I. Joe: The Movie DVD pack. in black and silver with Cobra Stinger Driver, with the Cobra Stinger released in 2009.
in silver with Python Officer, on the 2008 Wave 8 single card. in orange (two copies) with Zartan, on the 1993 Ninja Force card. in light blue (two copies) with Night-Creeper, on the 1993 Ninja Force card. in light blue (two copies) with Ken Masters, the red version on the 1993 Capcom Street Fighter II single card. in purple (two copies) with Dhalsim, on the 1993 Capcom Street Fighter II single card. in clear red (two copies) with Nunchuk, on the 1994 Shadow Ninjas card. in clear blue (two copies) with Night-Creeper, on the 1994 Shadow Ninjas card. in black and silver with Spirit Iron-Knife, the green version on the 2005 Direct-to-Consumer Wave 1 single card. in black and silver with Gallows, in the 2006 Plague Troopers vs. Steel Brigade six-pack. in black and silver with Outback, on the 2008 Direct-to-Consumer Wave 4 single card. in silver with Spirit Iron-Knife, the black version in the 2006 Devil's Due #16 comic three-pack. in black and silver with Lieutenant Falcon, the 25th-style version in the 2008 Comic #8 two-pack with Nemesis Immortal. in black and silver with Tele-Viper, the grey 25th-style version in the 2008 Arctic Assault Squad seven-pack. 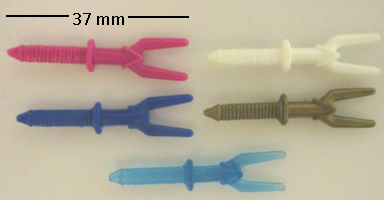 in silver (two copies) with Ice Viper, the red-mask version with the WOLF released in 1987.
in silver (two copies) with Ice-Viper, the blue-mask version in the 2007 Flaming M.O.T.H. two-pack with Snow Serpent Commander. in light grey with Backblast, the original version on the 1989 single card. in brown with Over Kill, the blue version in the 2003 Wave 5 two-pack with Tunnel Rat. in brown with Dr. Mindbender, the red Spy Troops version reissued with 2004 Mission Disc #2.
in silver with Over Kill, the purple version in the 2003 Wave 6 two-pack with Shipwreck. in silver with Beachhead, the silver-vest Valor vs. Venom version in the 2004 Wave 2 two-pack with Cobra B.A.T. v4. in silver with Baroness, the blue Valor vs. Venom version in the 2004 Wave 2 two-pack with Hard Drive. in silver with Venomous Maximus, the caped version in the 2004 Wave 4 two-pack with Duke. 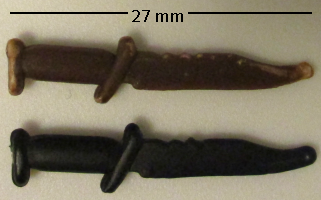 in black (two copies) with Cobra Slice, the Action Attack version in the 2004 Wave 3 two-pack with Agent Jinx. in black with Red Ninja Viper, in the 2004 Ninja Cobra Strike Team six-pack. in dark silver with Cobra Commander, the black hooded version the 2008 G.I. Joe Collector's Club annual exclusive figure. in brown and black with Headhunter Stormtrooper, the green version in the 2008 Cobra Headhunters convention set. 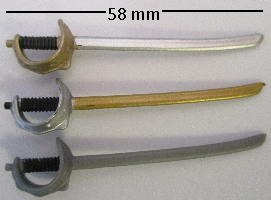 in brown and silver (two copies) with Shadow Strike, in the 2005 Ninja Battles set. in black and silver with Monkey Wrench, on the 2006 Direct-to-Consumer Wave 3 single card. in black with the Cobra Night Landing, the original version released in 1985 and reissued by mail in later years. in black with the Night Landing, released in 1997 as part of the Navy S.E.A.L. Mission. in dark grey with Steel Brigade Paratrooper, released at the 2005 G.I. Joe convention. in light grey with Stalker, the arctic version on the 1989 single card. in olive with Hit & Run, on the 1988 single card as well as his Target-exclusive reissue the same year. in olive with Spirit, the red version in the 1993 International Action Force mail-order set. in black with Lifeline, in the 2002 Real American Hero Collection two-pack with Sideswipe. in black with Cobra C.L.A.W.S., the red O-ring version on the 2004 Wave 1 single card. in orange with Night Creeper Leader, the orange version on the 1993 Battle Corps card. in gold with Night Creeper Leader, the purple version on the 1994 Battle Corps card. in silver with Gnawgahyde, on the 1989 single card. in silver with Shockwave, the original version on the 1988 single card. in silver with Stalker, the muddy-legs version in the 1993 Arctic Commandos mail-order set. in silver with Budo, the original version on the 1988 single card. in black with Slice, the red version on the 1992 Ninja Force card. in black with Slice, the orange version on the 1993 Ninja Force card. in magenta with Banzai, on the 1993 Ninja Force card. in white with Bushido, on the 1993 Ninja Force card. in blue with Ryu, the white version on the 1993 Capcom Street Fighter II single card. in blue with Edmond Honda, on the 1993 Capcom Street Fighter II single card. in gold with Vega, on the 1993 Capcom Street Fighter II single card. in clear green with Slice, on the 1994 Shadow Ninjas card. in clear blue with Bushido, on the 1994 Shadow Ninjas card. in light blue with Snake-Eyes, on the 1993 Ninja Force card. in yellow with Scarlett, on the 1993 Ninja Force card. in neon yellow with Chun Li, the blue version on the 1993 Capcom Street Fighter II single card. in purple with Sagat, on the 1993 Capcom Street Fighter II single card. in clear dark with Snake-Eyes, on the 1994 Shadow Ninjas card. in clear blue with Storm Shadow, on the 1994 Shadow Ninjas card. in magenta (two copies) with Banzai, on the 1993 Ninja Force card. in white (two copies) with Bushido, on the 1993 Ninja Force card. in blue (two copies) with Ryu, the white version on the 1993 Capcom Street Fighter II single card. in blue (two copies) with Edmond Honda, on the 1993 Capcom Street Fighter II single card. in gold (two copies) with Vega, on the 1993 Capcom Street Fighter II single card. in clear blue (two copies) with Bushido, on the 1994 Shadow Ninjas card. in chrome with Kamakura, the yellow-head version in the 2004 Wave 2 two-pack with Destro. in black with gold guard and silver blade, with Storm Shadow, the 25th-style Joe version on the 2007 Wave 1 single card, as well as his reissue on the 2007 Wave 4 single card. in black with gold guard and silver blade, Storm Shadow, the short-sleeves 25th-style version in the 2007 25th Anniversary Cobra five-pack. in black with gold guard and pommel and silver blade, Cobra Red Ninja, the black-belt version on the 2007 Wave 3 single card. 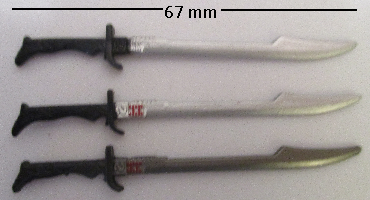 in black with red grip and silver blade, with Storm Shadow, the Valor-era 25th-style version in the 2007 Cobra Legions five-pack. 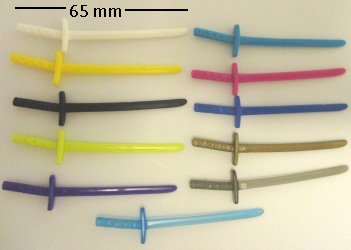 in blue with silver blade with Storm Shadow, the comic 25th-style version in the 2008 Marvel #21 two-pack with Snake Eyes. 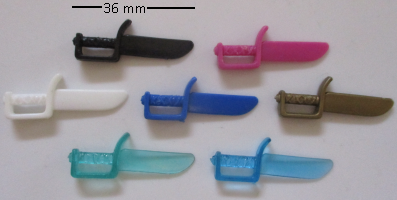 in teal with silver blade with Storm Shadow, the caped 25th-style version in the 2008 Comic #21b two-pack with Snake Eyes. in brown with black guard and silver blade, with Cobra Red Ninja Leader, in the 2008 Snake Eyes vs. Red Ninjas five-pack. 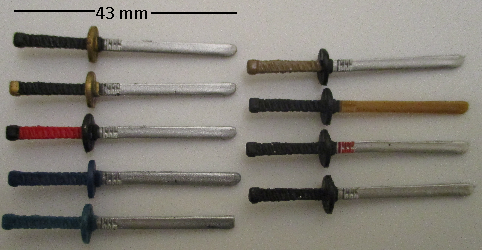 in brown with black guard and silver blade, with Cobra Red Ninja, the red-belt version in the 2008 Snake Eyes vs. Red Ninjas five-pack. in black with brown blade with Storm Shadow, the black 25th-style version on the 2008 Wave 9 single card. 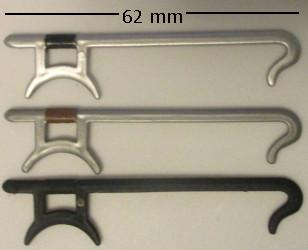 in black with silver blade and red Arashikage symbol, with Storm Shadow, the grey-belt sleeveless 25th-style version in the 2009 Cobra five-pack. in black with silver blade and red Arashikage symbol, with Storm Shadow, the black-belt sleeveless 25th-style version on the 2009 Hall of Heroes single card. in black with silver blade with Storm Shadow, the Joe vs. Cobra-era 25th-style version in the 2009 Greatest Battles DVD pack. in silver (two copies) with Jinx, the original version on the 1987 single card, as well as reissues by mail. in dark or light grey (two copies) with most copies of Ninja Viper, the original version offered by mail in 1992 and later years. At least a few came with no accessories. 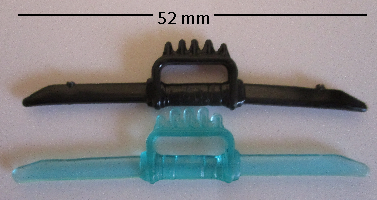 in black (two copies) with Vypra, the black version with the Rattler 4WD released in 1998.
in light silver (two copies, soft plastic) with Jinx, in the 2003 Tiger Force five-pack. in silver with Scarlett, the green Valor vs. Venom version in the 2004 Wave 1 two-pack with Sand Scorpion. in bronze (two copies) with Agent Jinx, the Valor vs. Venom version in the 2004 Wave 3 two-pack with Cobra Slice. in black and silver with Scarlett, the Desert Patrol Squad version in the 2004 Wave 5 two-pack with Switch Gears. in black with the Bivouac, released in 1984.
in gold with Gung-Ho, the dress blues version on the 1987 single card. in grey with Spearhead, the original version on the 1988 single card. in orange with Zartan, on the 1993 Ninja Force card. in light blue with Night-Creeper, on the 1993 Ninja Force card. in light blue with Ken Masters, the red version on the 1993 Capcom Street Fighter II single card. in purple with Dhalsim, on the 1993 Capcom Street Fighter II single card. in clear red with Nunchuk, on the 1994 Shadow Ninjas card. in clear blue with Night-Creeper, on the 1994 Shadow Ninjas card. in light blue with Muskrat, the original version on the 1988 single card as well as his reissue in the Ultimate Enemies two-pack with Voltar. in black with Muskrat, the Night Force version in the 1989 two-pack with Spearhead. in black with Duke, on the 1993 Battle Corps card. in black with Gung-Ho, on the 1993 Mega-Marines card. in black with Clutch, the orange version on the 1993 Mega-Marines card. in black with Ozone, the brown version on the 1993 Star Brigade card. in black with Ozone, the grey version on the 1993 Star Brigade card. in black with Stalker, on the 1994 Battle Corps card. in white with Frostbite, on the 1993 Battle Corps card. in gold with Robo-J.O.E., on the 1993 Star Brigade Armor-Tech card. in gold with Roadblock, the white version on the 1993 Star Brigade card. in gold with Roadblock, the orange version on the 1994 Star Brigade card. in yellow (some purple) with Rock 'n Roll, on the 1993 Star Brigade Armor-Tech card. in silver with Ozone, the red version on the 1994 Star Brigade card. in black with gold guard and silver blade, with Cobra Commander, the blue Resolute version on the 2009 Wave 13 single card. in black with gold guard and silver blade, with Cobra Commander, the black Resolute version in the 2009 G.I. Joe Resolute five-pack. 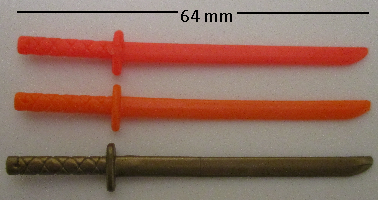 in black (two copies) with Slice, the orange version on the 1993 Ninja Force card. in clear green (two copies) with Slice, on the 1994 Shadow Ninjas card. in blue with Dojo, on the 1992 Ninja Force card. in black with Crimson Shadow Guard, one included in the 2005 Crimson Shadow Guard six-pack. in silver with Cobra Slash, in the 2005 Wave 6 two-pack with Cobra Slice. in silver with Quick Kick, the original version on the 1985 single card, as well as reissues by mail in later years (though these were of lower quality). in red with Budo, the original version on the 1988 single card. in tan and silver with Quick Kick, the 25th-style version in the 2008 The Pyramid of Darkness DVD pack. in black with Night-Creeper, the original version on the 1990 single card. in black with Night-Creeper, the white version in the 1998 Cobra Polar Force three-pack. in gold with Iron Grenadier, the original version on the 1988 single card. in silver with Budo, the blue version in the 1993 International Action Force mail-order set. in gold and grey with Hannibal: Reborn, in the 2006 Devil's Due #16 comic three-pack. in gold and grey with Serpentor, the 25th-style Devil's Due version on the 2007 Wave 2 single card. 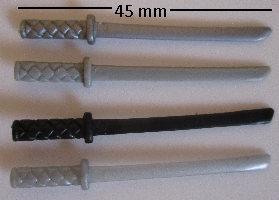 in black and silver with Snake Eyes, the grey crossed-swords version in the 2009 Greatest Battles DVD pack. in silver with Snake Eyes, the blue crossed-swords version in the 2000 Real American Hero Collection two-pack with Storm Shadow. in silver (two copies) with Storm Shadow, the white-and-red Joe vs. Cobra version in the 2002 Wave 1 two-pack with Snake Eyes. in silver (two copies) with Storm Shadow, the grey-and-red Joe vs. Cobra version in the 2002 Wave 1.35 two-pack with Snake Eyes. in silver (two copies) with Storm Shadow, the black-and-white Joe vs. Cobra version in the 2002 Wave 3 two-pack with Agent Scarlett, as well as his reissue on the 2004 Gum Bits single card. in silver with Night Creeper, the light blue version in the 2003 Wave 7 two-pack with Kamakura. in silver with Night Creeper, the black version in the 2004 Strike Team: Urban Division six-pack. in silver with Storm Shadow, the black-stripes Valor vs. Venom version with the white Ninja Lightning Cycle released in 2004.
in silver with Kamakura, the black-head version with the green Ninja Lightning Cycle released in 2005.
in gold with Black Dragon, in the 2003 Operation: Anaconda convention set. in white gold with Storm Shadow, the Action Attack version in the 2004 Wave 1 two-pack with Snake Eyes. in bronze with Night Creeper, the green version in the 2004 Wave 5 two-pack with Ninja Trooper. in bronze (two copies) with Ninja Trooper, in the 2004 Wave 5 two-pack with Night Creeper. in black with Vypra, the decorated-chest version in the 2004 Ninja Cobra Strike Team six-pack. in black and silver with Storm Shadow, the unmasked version offered by mail in 2005.
in grey with Kamakura, the grey-head version in the 2004 Wave 4 two-pack with Storm Shadow. in black with gold guard and silver blade, with Destro, the black Iron Grenadiers version on the 2008 Wave 5 single card. in black with gold guard and silver blade, with Iron Grenadier, the glossy 25th-style version in the 2008 Comic #7 two-pack with Destro. 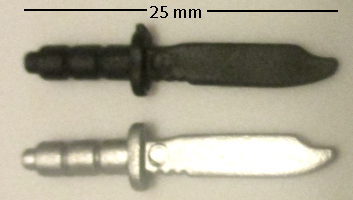 in black with gold guard and silver blade, with Iron Grenadier Officer, the flat black 25th-style version in the 2008 Senior Ranking Officers three-pack. in black with gold guard and silver blade, with Destro, the purple-trim Iron Grenadiers version in the 2008 Senior Ranking Officers three-pack. in black with gold guard and silver blade, with Iron Grenadier Trooper, the purple IG in the 2008 Senior Ranking Officers three-pack. in black with gold guard and silver blade, with Iron Grenadier, the glossy 25th-style version in the 2008 Marvel #86 comic two-pack with Cobra Viper. 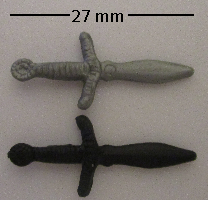 in black with silver guard and gold blade, with Destro, the grey Iron Grenadiers version in the 2008 Comic #7 two-pack with Iron Grenadier (both gold and black head variants). in black with grey guard and blade, with Destro, the silver-head Iron Grenadiers version in the 2008 Ultimate Battle Pack. in black and silver with Snake Eyes, the black-and-grey O-ring version in the 2005 Ninja Battles set. in black and silver with Snake Eyes, the new-head comic version in the 2005 Marvel #21 three-pack. in black with silver blade and red Arashikage symbol, with Snake Eyes, the arctic 25th-style version on the 2008 Wave 8 single card. in black and gold with silver blade (two copies), with Storm Shadow, the bare-chested 25th-style version in the 2008 Comic #4 two-pack with Firefly. in black and gold with silver blade (two copies), with Cobra Ninja Viper, the 25th-style version on the 2008 Wave 12 single card. in silver with Snake Eyes, the grey O-ring version in the 2002 Wave 3 two-pack with Cobra Commander. in silver with Snake Eyes, the black O-ring version in the 2002 Wave 3 two-pack with Cobra Commander, as well as his reissue with 2003 Mission Disc #2.
in black and silver with Snake Eyes, the blue-stripe Valor vs. Venom version with the black Ninja Lightning Cycle released in 2004.
in black and silver with Red Ninja Viper, the comic version in the 2005 Marvel #21 three-pack. in silver (two copies) with Storm Shadow, the red stripes/yellow cuffs version in the 2004 Wave 4 two-pack with Kamakura. in brown and silver (two copies) with Storm Shadow, the grey-stripes Valor vs. Venom version in the 2005 Ninja Battles set. in black with (two copies) Storm Shadow, the red stripes/red cuffs version on the 2005 Wave 3 single card. in light blue with T'Jbang, on the 1992 Ninja Force card. in silver with Storm Shadow, in the 2000 Real American Hero Collection two-pack with Snake Eyes. 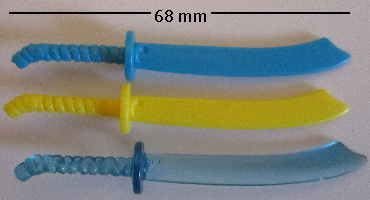 in silver (two copies) with Snake Eyes, the blue-trim Joe vs. Cobra version in the 2002 Wave 1 two-pack with Storm Shadow. 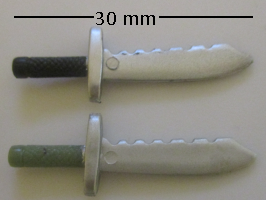 in silver (two copies) with Snake Eyes, the green-trim Joe vs. Cobra version in the 2002 Wave 1.35 two-pack with Storm Shadow. in silver (two copies) with Agent Scarlett, in the 2003 ToyFare two-pack. 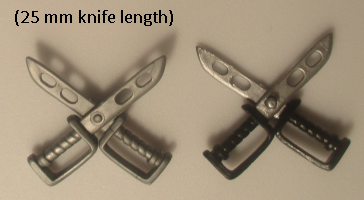 in silver with Snake Eyes, the grey Valor vs. Venom version in the 2004 Wave 1 two-pack with Storm Shadow. in silver (two copies) with Snake Eyes, the black O-ring version reissued on the 2004 Wave 1 single card. 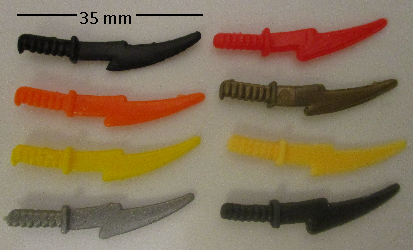 in black with Cobra Slice, the Action Attack version in the 2004 Wave 3 two-pack with Agent Jinx. in black with Storm Shadow, the dark grey version in the 2004 Strike Team: Urban Division six-pack. in black with Vypra, the decorated-collar version in the 2004 Ninja Cobra Strike Team six-pack. in white and silver with Guillotine, in the 2006 Plague Troopers vs. Steel Brigade six-pack. in red (two copies) with Snake Eyes, the missile launcher version on the 1991 Wave 2 single card. in orange (two copies) with Night Creeper Leader, the orange version on the 1993 Battle Corps card. in gold (two copies) with Night Creeper Leader, the purple version on the 1994 Battle Corps card. in white with Storm Shadow, on the 1992 Ninja Force card. in black with T'Gin-Zu, with the Ninja Raiders Pile Driver released in 1993.
in black and silver with Tiger Claw, in the 2005 Ninja Battles set. in yellow and white with silver blade, with Cobra Commander, the darker hood-and-cape version in the 2008 Comic #9 two-pack with Tripwire. in gold with silver blade, with Cobra Commander, the lighter hood-and-cape version in the 2009 Greatest Battles DVD pack. in gold with Destro, the Iron Grenadiers version with the Despoiler released in 1988.
in black with Nunchuk, the original version on the 1992 Ninja Force card. in silver with Cobra Slice, the red-and-grey version in the 2002 Wave 1.5 two-pack with Sure Fire. in silver with Cobra Slice, the O-ring Valor vs. Venom version in the 2005 Wave 6 two-pack with Cobra Slash. in dark grey with Taurus, in the 2006 Slaughter's Marauders convention three-pack. in brown and grey with Montezuma's Skeleton, in the 2008 Arise, Serpentor, Arise! DVD pack. in black and silver with Snake Eyes, the trainee version in the 2008 Comic #10 two-pack with Hard Master. in white and silver with Hard Master, in the 2008 Comic #10 two-pack with Snake Eyes. in black and silver with Snake Eyes, the purple 25th-style visor version in the 2008 The Pyramid of Darkness DVD pack. in black and silver with red Arashikage symbol, with Snake Eyes, the light-bandolier visor version in the 2009 G.I. Joe five-pack. in black and dark silver with red Arashikage symbol, with Snake Eyes, the dark-bandolier visor version on the 2009 Hall of Heroes single card.